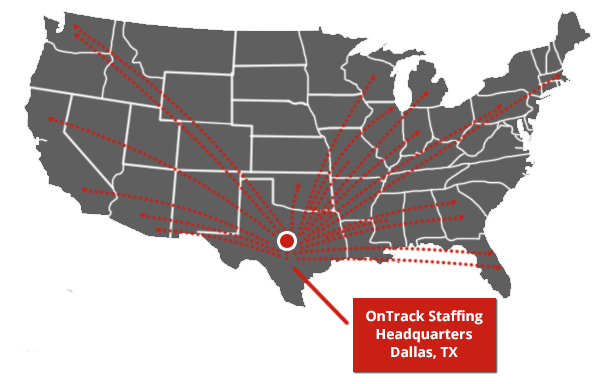 OnTrack Staffing is a US-based national staffing service with offices, OnTrack OnSite locations, and clients throughout the nation. For more than a decade, OnTrack has delivered cost-effective staffing solutions to both local businesses and Fortune 500 companies. Each member of our team is passionate and engaged. At the heart of every service we offer to clients and job seekers is a commitment: “Always provide the highest level of service.” You are our priority, and we want you to succeed. At OnTrack Staffing, our mission is to build long-term strategic partnerships with our customers by offering high-quality, high-level service in all areas of staffing. By being innovative, results driven, customer focused, and committed to quality and service, we provide employers with the most cost-effective hiring solutions and job seekers with the best career guidance. Whether you're looking for that next best gig or trying to locate that perfect talent, OnTrack Staffing has the resources and connections for success.